Here is one quick version… in case someone else wants to have one (and is too lazy to create it from scratch) hehe. Lets start by emphasizing that this is NOT a way to create a hack. In order for this to work you (the user) needs to be an Administrator and access to be able to launch applications in ‘Admin mode’ anyway. The first time when the application needs to set up this functionality it needs to run in Admin mode as well (for which you’ll have to be prompted by UAC). Only after this and for the future the application in ‘Non-admin’ mode can then relaunch itself in ‘Admin mode’ without showing the UAC prompt. The ‘trick’ (not hack) is to use the built-in Windows Task scheduler that can launch applications with the ‘highest’ priority setting. Take note that this also stops you from launching the app with any command line parameters – but there are other ways an application can ‘communicate’ with itself/another instance of itself e.g. by saving its own settings before launching the second instance and the second instance reading those settings again. So how can a (C#) application integrate this easily? My first idea was to call the Task scheduler (Schtasks.exe) manually with the required parameters to create a task of launching the app again later in admin mode. The problem part is finding out if the task already exists or not. Then I came across an article that showed how the COM+ library for the Task Scheduler can be used from .Net which make it a whole lot easier to interact. With all these ‘bits’ you can build an application that can launch itself in ‘Admin’ mode. Have fun kidz but not too much! I’ve tested this on Windows Vista, 7, 2008/R2 and 8. I don’t have access to any XP machines anymore but I doubt it will work on XP (or 2003)… duhh.. Just remembered XP and 2003 does not have ‘Admin’ mode anyway so this does not apply… silly me. A quick tip (script) how to list all the .Net (major) versions of a list of machines. $NETROOTKEY = "SOFTWARE\\Microsoft\\NET Framework Setup\\NDP\\v4"
$keyname = $NETROOTKEY + "\\Full"
$versionStr = $versionStr + "1.0,"
$versionStr = $versionStr + "1.1,"
$versionStr = $versionStr + "2.0,"
$versionStr = $versionStr + "3.0,"
$versionStr = $versionStr + "3.5,"
$versionStr = $versionStr + "4.0,"
$versionStr = $versionStr + "4.5,"
All you have to do is create a text file with a list of machine names (one name per line). It does assume you have Admin rights so you can access the C$ share and read the remote registries. This tip applies to all editions and even previous versions (2012, 2012) of Visual Studio. Since Microsoft has been releasing these updates e.g. VS2013.1 etc) the default behavior for these installers are to just download what is need at the time they are run. This is all good and well if you have only one machine that needs updating. What happens if you have to update a whole bunch of installs? Luckily the VS2013.x installers support an undocumented (or not well) command line parameter ‘/layout’ that allows you to have the full update downloaded to a local folder. From there you can run the same installer without the parameter and it won’t download any additional stuff again. It turns out it is not too hard to achieve this using C# and .Net 4.0 (might even work with older frameworks but haven’t tried it). It is an extension of my already improved self registering Windows Service extensions which make it possible to simply run the Service exe with a ‘-install’ command line parameter. With the latest additions a ‘named’ instance can also be specified. This means, in the Service Manager of Windows you can see the Service executable plus a command line parameter that makes it unique. It allows you to stop/start/manage it separately as an entity. This is exactly the same as how Microsoft BizTalk Server implements ‘Host Instances’. Now lets get dirty with some code samples. The first code snippet shows (an example) part of main program.cs that handles the command like parameters. All this section does is to check for the “-INSTALL” or “-UNINSTALL” parameters and then call the helper class that does the registration/unregistration. The Display name of the service instance is always prefixed with “Event Reaper – ” to grouped all instances visually together in Service manager. The ServiceRegister class only has two methods. InstallService is the first one and handles all the bits to gather login details, set properties and then register the service. The class InstallerForm is simply a plain Windows Form to capture service properties like the username/password etc. I’m not showing its code here now. AssemblyPath is the actual property that Service manager use to launch the executable plus its parameters. This is essentially just the reverse of InstallService. I’ve been wanting to creating something like this for myself for a while. A simple tool to quickly create a backup copy of a SQL Server database ‘structure’ (or schema if you will). It is really a simple command line tool that simply takes a few parameters like server\instance name, database, output directory and a prefix name for the output files. Grab it here (plain exe in a zip file). It make use of the .Net 4.0 client framework. I have this really old tool I create (literally) 10 years ago do help with some MSMQ related development stuff at the time. Since then I have hardly touched it (source code) but it still seems to work to this day – even on Windows 7. It was intended to help me/developers to ‘see’ what is going on inside some test queues while we were in the process of working with a system that we developed that uses the technology. 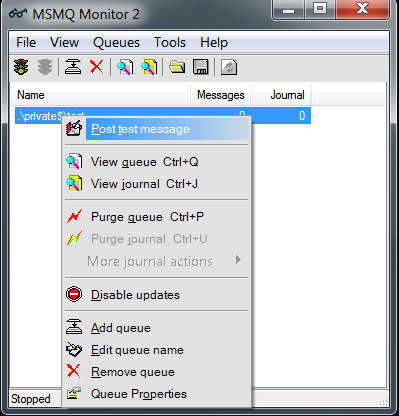 The ‘Tool’ is really simple yet really powerful to do just what it was intended – to monitor MSMQ queues and let you manipulate messages inside the queues. 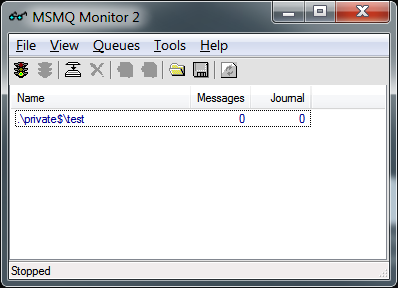 It can view/create/delete/resubmit and do all kind of crazy things with MSMQ messages. 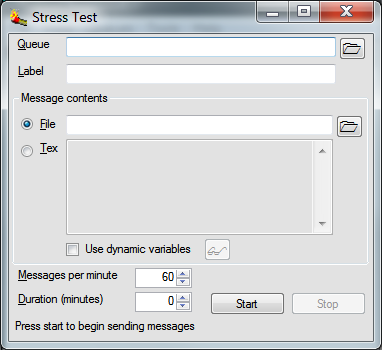 It even has a simple MSMQ stress tool built right in! Of course, this tool is provided ‘as is’. I simply thought of sharing it if someone else might find it useful. The source code was/is written in plain old vb.net.